Found it: GDI set gold dowsing L rods! 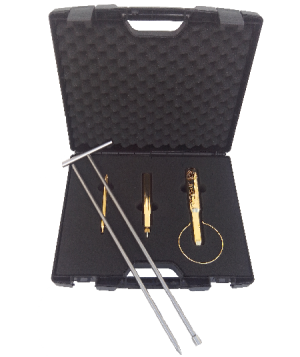 The most affordable gold detectors, a popular and remarkable dowser tool, used for gold dowsing and water dowsing. The proper technique for dowsing – radiesthesia requires the dowser to hold with the dowsing rods, a sample of the same kind of metal he wishes to locate. That is reason the L rods are gold plated. This way a sample is not necessary anymore when searching for gold, and reliable results are reported. Also gold by nature does not suffer oxidation from human skin PH, and provides better electrical contact between the L rods and the user himself. 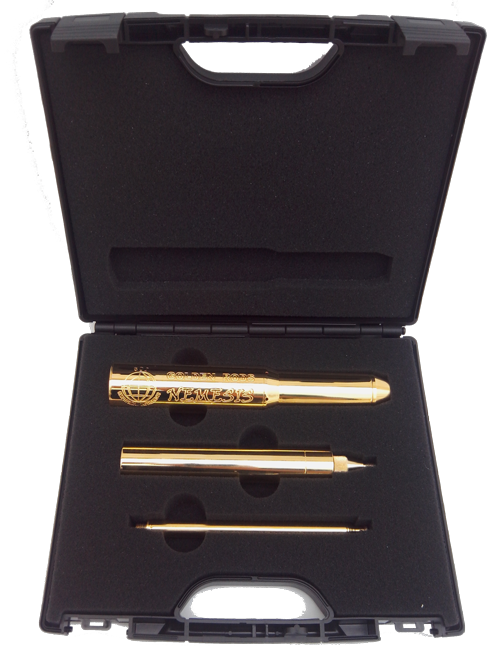 NEMESIS GOLD RODS have been designed with the accumulated knowledge gained from many years using gold detectors and directional dowsing rods by experienced gold dowsers. We set the goal to create a better dowsing rod in terms of quality, durability and performance. χCheck out NEMESIS GOLDEN RODS dowsing gold detectors by GDI! APOLLO GOLDEN RODS have been designed with the accumulated knowledge gained from many years using gold detectors and directional dowsing rods by experienced gold dowsers. Check out APOLLO GOLDEN RODS dowsing gold detectors by GDI! Are you interested? Feel free to ask for any information about our detectors. Contact us by email and we will reach you as soon as possible.